I scrolled down my facebook feed in disbelief and discomfort as I reluctantly watched the violence unfolding in Dhaka. My homepage was filled with frustration and anger as arson attacks on public transports made headlines, stories of atrocities broadcasted, and the whole country stalled with never ending strikes. Amongst this chaos, I noticed one particular incident that has triggered debates and discussions on moral and ethical boundaries of photography. 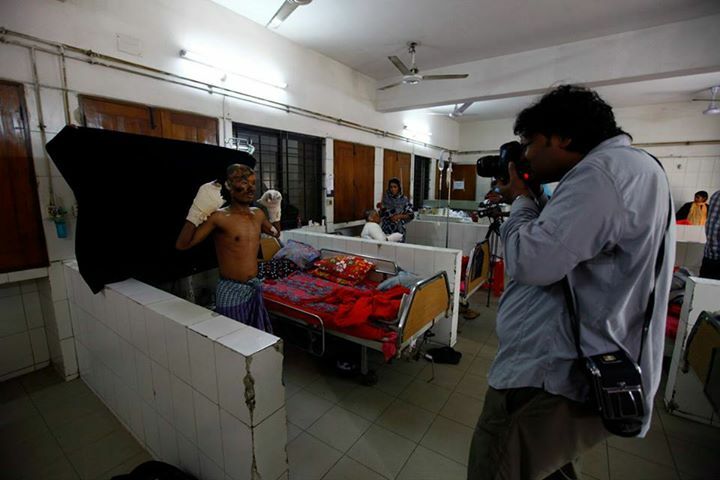 Last week, couple of images emerged in social media where a photographer was seen taking photos of patients who were under treatment in the High Dependency Unit at Dhaka Medical College Hospital. 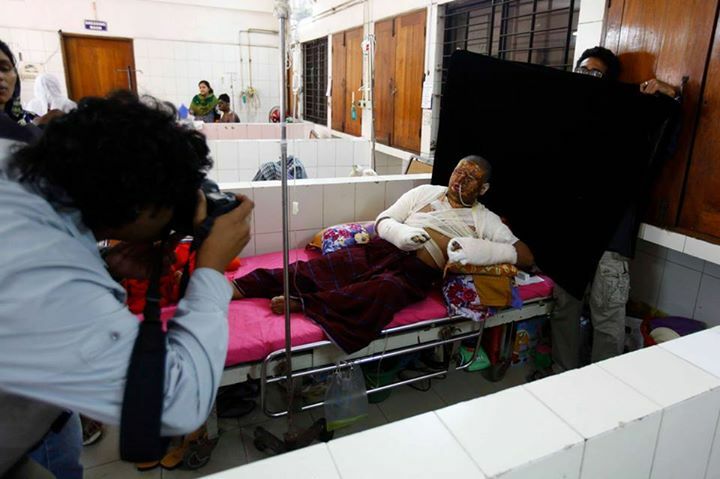 Saiful Huq Omi, an internationally renowned freelance photographer famous for his documentary style, was taking portraits as his assistant held a black backdrop behind the victims of petrol bomb attacks. The photos, also published in national Newspapers, received severe public backlash. The criticism escalated, and even became borderline bullying in few cases, when Omi posted a Facebook status defending himself, mentioning about the presence of other photographers and claiming that he asked for consent before clicking. The note, (which has been made public - Link), bypasses his intrusion, does not mention the risk factors of entering into a medical unit without protection, and clearly does not address the concerns of the people criticizing it. Rather it explains how the black background is a part of the photographer’s documentary style of taking portraits and mentions the blurred line of ethical boundary. What Omi and the other photographers supporting him do not realize is that the criticism is not about his style of work. People understand the professional scope of photojournalism and requirement of visual proof of violence for news. It is mostly about the photographers’ lack of empathy. It did look like the photographer was oblivious to the pain and distress of the patients as he staged a portrait session inside a hospital unit. The burned victims, as they undergo treatment with fresh wounds and exposed skins, are highly vulnerable to infections. The risk of such infections exacerbates and may even result in death if proper protective measures are not taken around such patients. 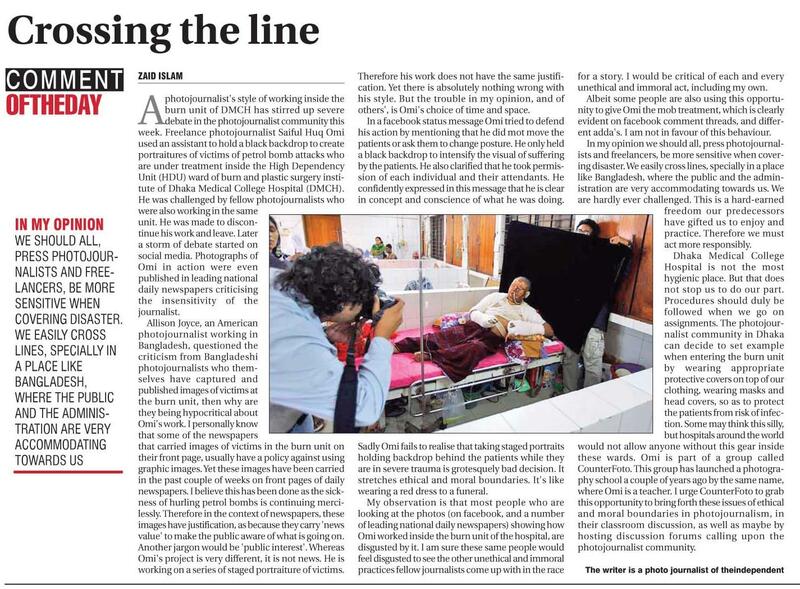 Thus, the photographer(s) inadvertently risked the patients’ lives with their impunity towards not taking precaution, let alone their unwillingness to ask the permission of the hospital authority. This kind of logical fallacy just affirms the intrinsic callous gesture. The photographer made a conscious choice about portraying the patients and their suffering and yet, is apathetic about potential health hazards! It is true that Omi is receiving most of the heat as he is the one in the photograph but the argument seems like a kindergarten kid who is justifying his misdeed by telling other children were also involved - but look! Johnny did it too! According to the news (and it is quite obvious too) there were other photographers, with the same intent, inside the same room, all trying to capture the sufferings and severity of the victims and yet none of them took the basic preventive measures. May be it’s time for the photographic community to acknowledge their part of responsibility and to own their collective impact on peoples lives! This incident did not happen in a crisis zone and the photographer(s) had the opportunity to shoot later (when the patients recover back to their everyday life) or at least take precautionary steps before shooting. Again, people are disgusted and reacted at this level because the insensitivity was evident. However, stereotyping the whole photographer community as opportunist vultures is irrational; harassing Omi and sending him hate mail are equally objectionable (some fellow photographers took it as a chance to troll which is disgusting). Instead of lynching Omi in print, the photography community should take this as an opportunity for self-reflection, a concept that is missing from the many discussions in social media. It is necessary to have a working culture that clearly defines the roles and responsibilities of photographers, especially with so many promising minds entering the profession, so that the community can thrive and be truthful to their intention of making an impact in the society. Finally, on a personal note, as an amateur photographer from Bangladesh, I am ashamed, upset and perhaps partly liable for the fact that a photographer who certainly has the eye for artistic interpretation of pain, can turn a blind one towards the safety and well-being of the same people he photographs. 1 | Submitted by himu on Thu, 12/02/2015 - 6:37pm. I wonder, why these photographers are crowding in a HIGH DEPENDENCY HOSPITAL UNIT at lunch break, when no supervising physicians are around, and have never appeared in or near the scene of these atrocious acts of violence. Instead of portraying the violence and the perpetrators, they are flocking around maimed victims, treating them like sitting ducks. It explains a lot about this particular bunch of photographers who have turned a HIGH DEPENDENCY HOSPITAL UNIT into cozy little corners to manage their shots better, being blatantly oblivious to the patient safety. These pathetic people behind the camera deserve no respect at all. Their excuses are no better than those from the arsonists. If they want to do photography on this mass arson, they should haul their asses to the streets, where these attacks are happening. Mothereffing cowards. 2 | Submitted by fahimhassan on Tue, 17/02/2015 - 2:58am. There were several photographers inside the burned unit sensationalizing the violence, trying their best to get a shot which will perhaps end up in the front-page of a news paper and will bring them awards and recognition. Like you have mentioned, it is disturbing to see that none of these photographers cared about the safety of the patients. 3 | Submitted by guest_writer on Thu, 12/02/2015 - 11:47pm. Personally, I don’t know whom to detest more, the photographer caught in the act of making a prizewinning photo, or the cameraman who shot him. All the news reports seem to harp on the inhumanity of making the victims pose for the camera, while being purposefully blind to their own immoral, unethical, and illegal act of entering the hospital ward without the proper authority and without the proper gear. Recounting the reporter's side of the story, “the photographed man was in a lot of pain (which was overlooked by the physicians, and other cameramen, who were absent from all the photos) and decided to stretch, when I asked for permission to take a photo"… Sure, and coincidentally, at that moment his assistant just walked behind him and put the black curtain up. I think we the readers are partly to blame. If one newspaper takes the ethical road, and shows up on our doorstep without graphic details of the BNP festivities, we will immediately switch to another with the juicy, gory details. Remember the famed image of Rana plaza, when who workers were ‘captured’ in an embrace of death? I won’t be surprised if the photographer who captured the shot got a Pulitzer. I would be surprised, however, if the photographer could tell me the name of the two victims. 4 | Submitted by yhoque [Guest] on Fri, 13/02/2015 - 2:45am. Regards the first photo (the one with the victim raising his arms), Mr. Omi used the excuse in his post that the person had risen to look for his shoes, and it was at that point that he asked him if he could take a picture in front of the black background. Basically, asking him to hold his pose raising his hands. His reasoning is that he 'asked him for permission'. The funny thing is what does he expect the poor victim to do? Say no? I doubt he would have the courage to do so. It falls on Mr. Omi and other photographers who went to the burn unit to have the decency to stop doing what they're doing and leave. Raise awareness, my foot. More like these inhuman reprobates are thinking of the amount of publicity they can get from these pictures in their next photo exhibition! For shame! 5 | Submitted by ishtiaqrouf on Fri, 13/02/2015 - 3:39am. The most painful part, as you have pointed out in the post, is the lack of empathy. The photographer seemed more eager about defending his style of photography than the well-being of the patient. 6 | Submitted by fahimhassan on Tue, 17/02/2015 - 3:01am. The sheer lack of empathy is shocking; and the unapologetic self-defense note of Omi shows that he still doesn't get it. 7 | Submitted by L. Rahman (not verified) on Fri, 06/03/2015 - 8:32pm. Lack of common sense, lack of etiquette, lack of decency, lack of concern for all things other than one's own. A reflection of the society we grow up in. In developed societies these are basic elements of children's education from the time a child is born.Painstakingly drilled in into the new born by the parents, the relatives, the community at large, the school system.